My father Fritz Caspari was born to German parents in Switzerland in March 1914 just before the outbreak of the First World War. As it happened, shortly after he was born, his father made a business trip to Russia just as that war started and was interned there as a civilian prisoner for the duration. Fritz was mainly brought up in Heidelberg, Germany and partly influenced by his mother’s strong pacifist views. He was intensively engaged with politics from an early age. He also traveled widely to other countries in Europe on family exchanges while still at school. 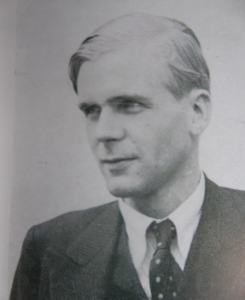 This gave him an international outlook and perhaps helped him win one of two Rhodes scholarships for Germans to go to Oxford University in England in 1933. He studied there until 1936 and obtained an M. Litt in Economics and Political Science. He then took up an assistant professor teaching position at Southwestern University in Memphis, Tennessee for one academic year before returning to Germany to write his PhD dissertation and complete his military service. He returned to the US early in 1939 to take up a teaching position as a Tutor in History and Instructor in German Language and Civilization at Scripps College in Claremont, California. Just before the outbreak of World War II he returned to Germany again to see if he could persuade his sister to leave but was unsuccessful in this venture and returned to the US in October 1939 to carry on teaching at Scripps. Fritz was and had been profoundly opposed to the Nazis in Germany and felt strongly that he did not wish to fight for them hoping that one day he would be able to return and help re-build a better Germany. However in 1941, as the US increasingly shifted towards entry into the war, he became increasingly concerned about the risk of detention. With the help of the Rhodes Trust in the US, a dossier with many letters of support documenting the fact that he was not a supporter of the Nazis was submitted to the Department of Justice. Nevertheless, like so many others of Japanese, Italian and German descent on the West Coast, on December 8, 1941 he was arrested as an “alien enemy” together with his friend and colleague at Claremont, Professor Arnold Bergstraesser He was first taken to the Terminal Island Federal Correctional Institution in San Pedro and from there on December 18 to the San Pedro Detention Station. This was how arrest was reported in Los Angeles Examiner. 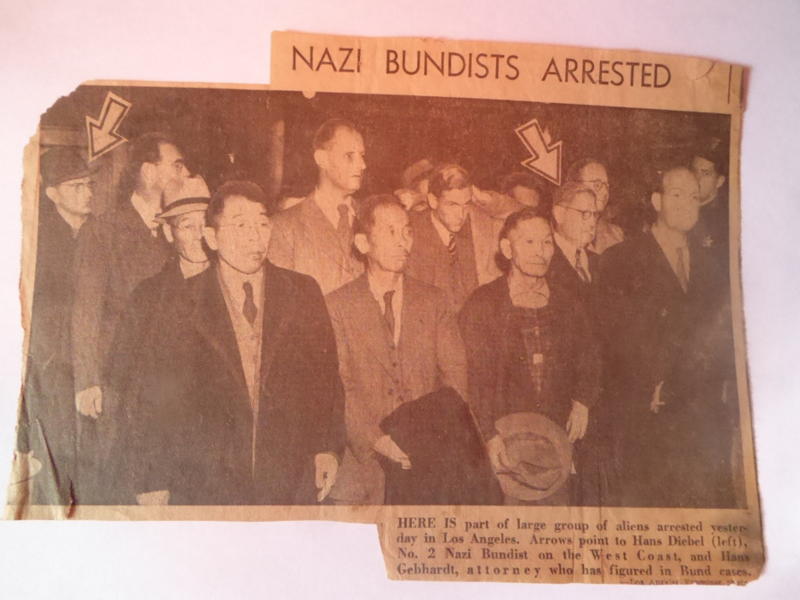 The headline is misleading because the majority of the people inn the picture were not in any way linked to the Nazi Bundists. Fritz Caspari, in the center right of photo holding his arm to his head, was firmly opposed to the Nazi regime. He was detained there until February 26 1942, but after a hearing on January 23, 1942, where the charge against him was summarized as “German sympathies,” he was released. Fritz and Professor Bergstraesser were both re-arrested on September 11, 1942 and sent to the Tuna Canyon Detention Station. This appears to have occurred largely in response to random testimony from FBI agents as well as their “informants.” This included “evidence” from an agent who claimed to have seen my father out walking with a woman in the mountains near some electricity transmission lines and sending “signals” by mirror. Sixty years later we worked out that this was my father playing a tune to his girlfriend (later my mother) on a metal harmonica . But, above all, there was a secret letter denouncing both men from the president of Scripps College who had been supporting them in public, albeit lukewarmly, especially when the local American Legion Chapter demanded that they should not be re-instated in their teaching positions. During his time at Tuna Canyon Fritz became the mess officer and tried to ensure that all the detainees could obtain decent food in line with their cultural preferences. It took a second hearing on September 15, 1942 to enable Fritz to finally be released on parole on January 13, 1943. In the meantime he had lost his job at Scripps College but he fortunately managed to get a job as a librarian at the Newberry Library in Chicago for the duration of the war. Finally, at the end of 1945, he was released from parole. During his time in Chicago in 1944 he married Elita Walker in Los Angeles and they had their first child in 1945. In 1954, after a further nine years teaching at the University of Chicago, Fritz fulfilled his ambition to help with the re-building of Germany when he went back to work for that county’s Foreign Service. During his time there he was posted to London as a Counselor at the German Embassy, then to New York as Deputy Head of the German Mission to the United Nations, then back to Germany to work for the Foreign Service and then as foreign policy advisor to the German President whom he accompanied on state visits, many of which were devoted to the process of reconciliation between Germany and countries which had suffered at its hands. His final posting was as German Ambassador to Portugal where he was present during that country’s turbulent post-revolutionary years, and he helped in the establishment of democracy there. In his retirement he continued teaching as an Honorary Professor at the University of Cologne in Germany. He received many honors including being an Honorary Fellow of St. John’s College, Oxford, England. My father was lucky to have been young when he was arrested and detained. 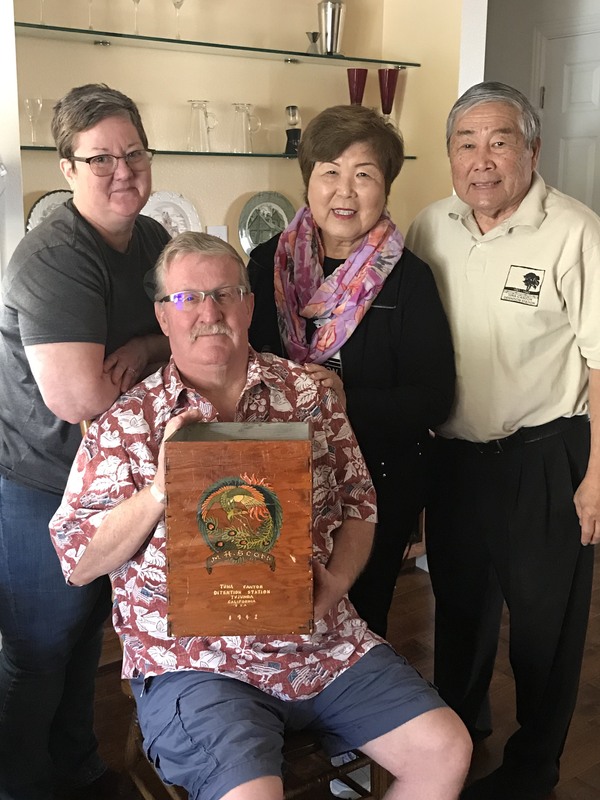 His periods of detention were relatively short due to the strong support he had from many friends in the US and UK and, although he ultimately lost his job in California, he was able to find another one. He considered himself to have been largely well treated in detention and was hugely relieved not to have been sent back to Germany or on to additional imprisonment at Ft. Lincoln, North Dakota or elsewhere like so many others. Nevertheless, the apparently unwarranted arrest at the start, false charges, denunciations and the sometimes onerous parole conditions he experienced after he had deliberately exiled himself to escape from the Nazi regime he detested in Germany formed part of a very difficult period in his life, were profoundly disillusioning, and something he found difficult to talk about much in later life.